I love the odd ducks group on ravelry’s swaps. 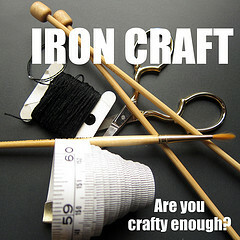 The topics are often off the wall and inspire the best and most creative crafting from all the members. I’m trying to get a package finished to ship out. It’s due at the end of this month, but it looks like I’ll ship in the first week of July. I hate being late, but I am one of the best spoilers out there and it takes a while to properly stalk a person and craft a package that will leave them breathless. 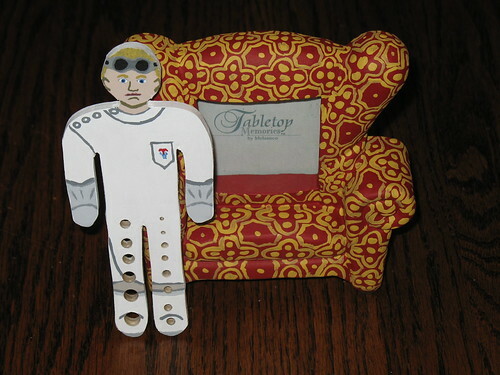 The swap I’m working on right now is the Doctor Horrible’s Sing Along Blog swap. Everything has to be themed around that movie. For starters, I decided to make my partner a needle gauge. She knits socks constantly and most store bought needle gauges don’t go small enough for sock needles. I’ve noticed most gauges stop at size 0 and I’d like them to go to 000 or smaller. Conveniently, guy pal has a great set of drill bits and a drill press AND was willing to help me. I first cut out a shape on my scroll saw pulled from the outline of a man on a restroom sign. I just added a little neck in before cutting it out of craft plywood from Michael’s Arts and Crafts. I sanded it lightly and started figuring out what size holes I would need. Knitting needles are measured in mm and the drill bit set I have access to is in inches. So I spent quite a while with a calculator and digital calipers trying to decide if I wanted to go with a .072 or a .068 inch bit for a given hole. I drilled all the holes with a little help from guy pal. His drill press and I aren’t good friends. He and I got holes drilled to make this needle gauge go from size 000 to 10.5 and tested the holes with my own needles to be sure they were just right. 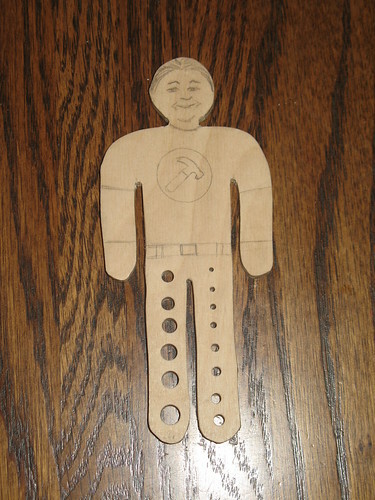 Then I took the cutout shape with holes home to draw a Captain Hammer on it. I figured that it would be great. I could include on the gift tag that it was from Dr. Horrible’s knitting bag. He does seem like the type that would have a voodoo Captain Hammer as his needle gauge if he knit. After finally being satisfied with the new drawing I pulled out the box of acrylic paints and set to work. After finishing painting the Dr. Horrible needle gauge, I ended up re-drilling all the holes because the paint had closed some in just a little bit. Next time I may drill all the holes after painting so I’m not doing the work twice…or be more careful with the paint. While painting the needle gauge, I also painted the awesome chair that Dr. Horrible has in his lair. He sits in it holding a picture frame with a picture of Penny in it when he sings about handing her “the keys to a shiny new Australia.” Everyone in the swap group seems to really love this chair. 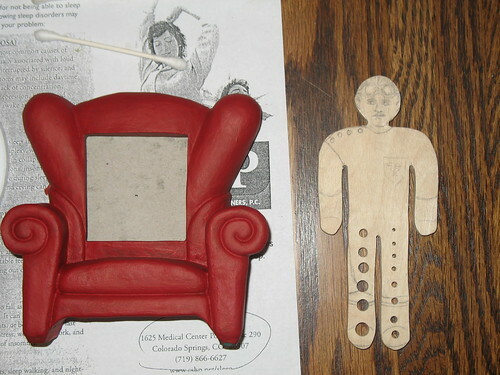 When I was out shopping at a local thrift store, I found a picture frame shaped like the big chair! It was filthy and the paint job was really bad–not at all Dr. Horrible. I cleaned it up and painted it to match the one in the film. It combines the picture frame he’s holding AND the chair he’s sitting in. I think it should score me some mad creativity points. It’s really a shame for the sake of photographing them that he’s not smaller and the chair’s not bigger. That chair is really HUGE in the movie! 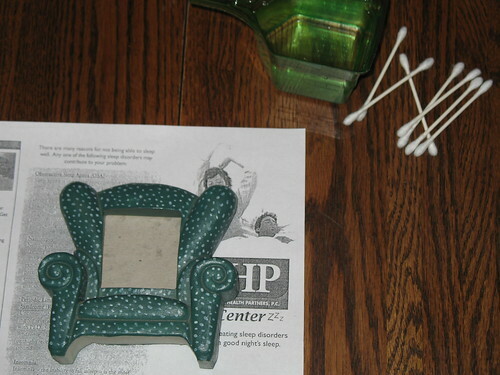 Remember, while I may not be able to duplicate the chair frame due to the strange find at the thrift store, if you need a custom needle gauge, leave me a comment or send me a message on etsy! They are a time consuming task, but the result is totally worth it! I’m sure I’ll be making another one for each swap I’m in and a few more generic ones for my store. It’s so unique while being sturdy enough to handle getting tossed about in a knitting bag and functional enough to please even the most difficult swap partners. It’s also super easy to make them fit different themes if you’ve got scroll saw skills!